Today in history, on June 28, 1098, one of the most epic battles between Islam and Christendom took place: that for Antioch. Context: In the years following the Battle of Manzikert (1071), which saw the Seljuk Turks defeat the Eastern Roman Empire and conquer that ancient bastion of Christianity, Anatolia (modern day Turkey), immense persecutions of Christians followed. Whether an anonymous Georgian chronicler tells of how “holy churches served as stables for their horses,” the “priests were immolated during the Holy Communion itself,” the “virgins defiled, the youths circumcised, and the infants taken away,” or whether Anna Comnena, the princess at Constantinople, tells of how “cities were obliterated, lands were plundered, and the whole of Anatolia was stained with Christian blood”—it was the same scandalous tale of woe. Enter the First Crusade, which, as historian Peter Frankopan has shown, was first and foremost a result of the attack on Eastern Christendom. Or to quote historian Thomas Madden, paraphrasing Pope Urban II’s famous call at Clermont in 1095, “The message was clear: Christ was crucified again in the persecution of his faithful and the defilement of his sanctuaries.” Both needed rescuing; both offered an opportunity to fulfill one of Christ’s two greatest commandments: “Love God with all your heart” and “love your neighbor as yourself” (Luke 10:27). Christians from all around Europe, under the leadership of the Franks, hearkened to the call and took the cross. After a long and arduous journey into Turkic-controlled Asia Minor—which saw the crusaders meet and defeat their Muslim foes in at least two encounters—by October 1097, the Europeans were at and besieging the walls of Antioch. Once one of Christendom’s greatest cities, Antioch was now a shadow of its former-self. Its Turkic governor, Yaghi-Siyan had long been persecuting the resident Christians, who still made the majority, including by increasing the amount of jizya-tribute, launching arbitrary wholesale persecutions, forcing Christians to convert to Islam, and converting Antioch’s ancient cathedral into a horse stable. After eight months, the strong walls of Antioch could still not be breached. Starved crusaders were reduced to eating dogs, rats, and thistles; a particularly severe winter set in. Eventually, a Muslim tower captain—an Armenian Christian converted to Islam during Yaghi’s persecutions—made a deal with Bohemond. Under the cover of night of June 3, the emaciated warriors, having clandestinely been brought into the city, were running wildly and slaughtering everyone in the streets. As with the later crusader sack of Jerusalem in 1099, this incident is regularly cited by Islam’s apologists to demonize the crusaders. In reality, it was a fraction of what Muslims had done to countless Christians during the preceding decades—an inconvenient fact ignored by Islam’s apologists. Nor were the motives of crusaders and jihadis the same: the former engaged in violence to liberate oppressed Christian cities and regions, whereas the invading Muslims came to conquer what was never theirs. On the very next day, Kerbogha, the atabeg or Turkish lord of Mosul, arrived with an enormous relief force. Antioch was quickly blockaded, and they who only yesterday were the besiegers became the besieged. Another famine struck—by the time the crusaders took Antioch, most of its stores had been depleted by the besieged—and the hold upped warriors were reduced to eating shoes and drinking horse blood. After marching thousands of miles, fighting, starving, and dying, they were granted nary a day to celebrate the liberation of Antioch. All powerful God, whose judgement never errs, who never permits the unjust to triumph over the just, why have you betrayed those who, out of love for you, have given themselves over to daily torment and death, who have left their relatives, wives, sons, the greatest honors, their native land, and why have you exposed them, without the aid of your protection, to be cut down by the swords of abominable men?… But so be it. It may be that you want them to die for you, and that you will crown them with glory and honor, yet … [y]ou have plunged the entire Christian world into the depths of despair and incredulity, and you have provoked the worst men [Muslims] to display relentless aggression against your people. From this day forth no man will expect anything great from you, since those who believed themselves dearer to you than all other mortals have been subjected to such an unworthy fate. Therefore, O most gracious one, from now on why should they call upon you, when your own people will expect such a death? There was nothing to it but for the famished, desperate, and outnumbered crusaders to sally forth and meet the hordes besieging them. But before doing so, they resorted to a final effort at “dialogue” (such as it was then between Christians and Muslims). Our leaders and elders are greatly astonished that you would boldly and arrogantly enter into Christian land and their land. We think and believe—possibly—that you have come here because you want to become Christians. Or maybe you have come here because you want to wrong the Christians in every way possible. All the same, our leaders ask that you at once leave God’s land and the Christians’ land… And they will allow you to take all of your possessions with you. Go back right away and tell your elders that if they desire to become Turks [synonymous for Latin writers with “Muslim”] in all things and if they wish to renounce your God whom you submissively worship and to repudiate your laws, then we will give them this land and more than enough from our land, including cities and castles such that … all of you will become knights and be like us, and we will always hold them to be the closest friends. Otherwise, let them know that they will all be punished by death, or else led to Khorasan where they will be forever throughout all time the captive slaves of us and our children. So it would be war. The crusaders ordered a three day fast; whatever scant food was available was given to the horses. Then everyone, lord and commoner “marched through the city squares, stopping at churches and calling on God’s aid, barefoot and crying, beating their breasts, so grief stricken that father would not greet son, brother would not look at brother,” to quote Raymond of Aguilers, who would later ride out with the army. 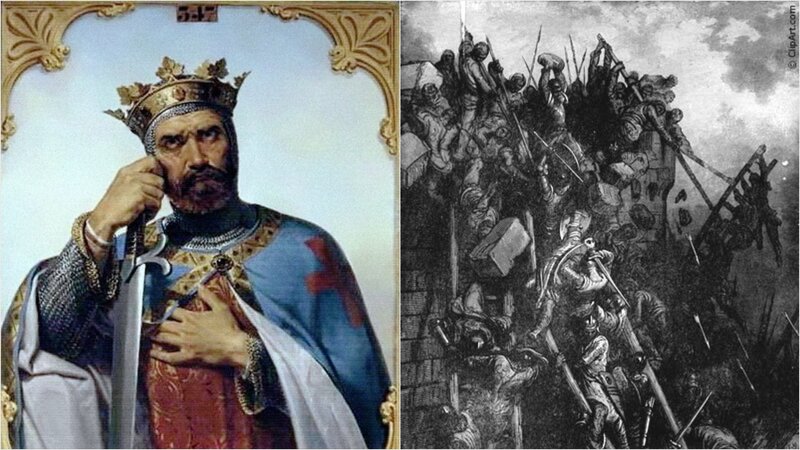 Thus, on the morning of June 28, 1098, “everyone received the Eucharist and offered themselves to die for … God, if he should wish.” Then the outnumbered crusading army, minus 200 left to defend the city, sallied out of the gates of Antioch. Idly playing chess in his tent, Kerbogha was taken unawares: “Didn’t you tell me that there were few Franks and that they would never fight against me?” he barked at a subordinate. A wild battle commenced. The Muslims threw everything they had—even fire—at the crusaders. But the desperate knights fought with a feral fury. Accounts speak of them “bristling like porcupines with arrows, darts, and javelins, but still moving forward and fighting ferociously,” writes Andrew Wheatcroft. Their disciplined orderliness and remarkably tight formations eventually caused the Muslim horsemen—used as they were to overwhelming their enemies with darts—to panic and retreat. Next a scene reminiscent of when Muslims and Franks first fought more than three centuries earlier at Tours, France, unfolded. Convinced that this was just another feigned retreat, the Franks “spent the night there and, always on watch, guarded themselves well. For on the following day they thought the fighting would be renewed by the Saracens, but these, exceedingly terrified, had fled on the same night,” much to the surprised relief of the Europeans. The rest is history—as with all crusader kingdoms, Muslims reconquered Antioch in 1268—and is chronicled in Sword and Scimitar: Fourteen Centuries of War between Islam and the West.